U.S. equities have resumed their upward trajectory on Monday, pushing the S&P 500 away from resistance near the 2,800 level amid growing hopes for a trade deal with China. President Trump, for the past two weeks, has talked up the chances of a deal just before equity futures open for trading Sunday night — bolstering spirits heading into the cash open. A busy week lies ahead, with a batch of economic data, a decision by the European Central Bank and the February jobs report all due. While the Q4 earnings season is largely behind us, there is still a heavy flow of headline risk. 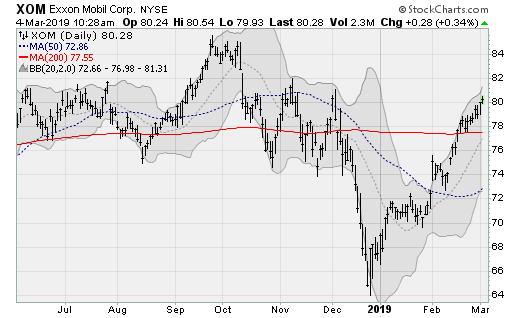 Exxon Mobil (NYSE:XOM) shares are pushing up to test highs not seen since early December, marking a rise of 25% from their recent low. Crude oil prices, while well below the levels seen last autumn, are still up roughly a third from the late December low. Shares were recently upgraded by analysts at Macquarie. The company will next report results on May 3 before the bell. Analysts are looking for earnings of 88 cents per share on revenues of $70.43 billion. When the company last reported on Feb. 1, earnings of $1.44 per share beat estimates by 35 cents on an 8.1% rise in revenues. 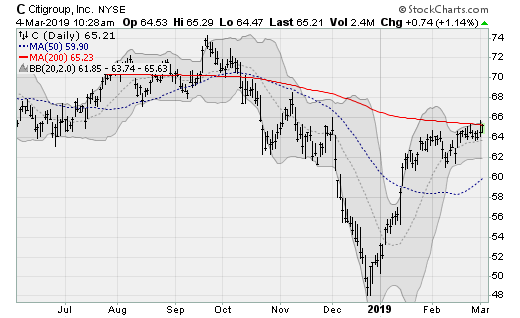 Citigroup (NYSE:C) shares are making a run higher, threatening an upward cross of their 200-day moving average, capping an impressive 35% rally off of the December low. This puts shares squarely in the middle of the October-December trading range, setting up an extension to the September high, which would be worth a gain of nearly 14% from here. The company will next report results on April 15 before the bell. Analysts are looking for earnings of $1.83 per share on revenues of $19.08 billion. When the company last reported on Jan. 14, earnings of $1.64 per share beat estimates by 9 cents on a 2.3% decline in revenues. 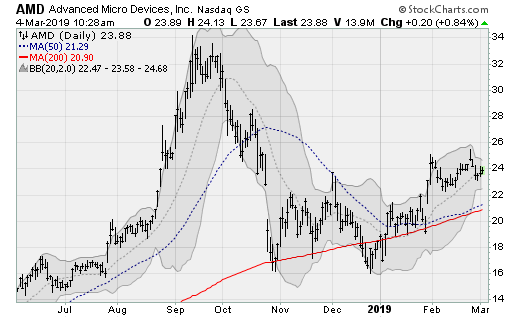 AMD (NYSE:AMD) shares are enjoying a steady rise along their 20-day moving average, pushing up and over their early December high to retrace much of the near 50% loss suffered from the levels tested in September. Semiconductors are the raw materials of the modern economy, with digital smarts in pretty much every manufactured device. Hopes of an economic resurgence has boosted the entire sector in recent months, AMD included. The company will next report results on April 30 after the close. Analysts are looking for earnings of 2 cents per share on revenues of $1.25 billion. When the company last reported on Jan. 29, earnings of 8 cents per share matched estimates on a 5.9% rise in revenues. 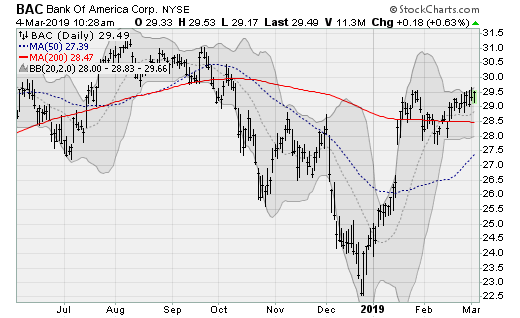 Bank of America (NYSE:BAC) shares are consolidating above their 200-day moving average but look ready for an extension back to the highs seen last summer. A move that should be worth a gain of around 5% from here. Management recently announced another $2.5 billion share repurchase program. Watch for a rebound in long-term interest rates to bolster net interest margin expectations for the sector. The company will next report results on April 17 before the bell. Analysts are looking for earnings of 66 cents per share on revenues of $23.39 billion. When the company last reported on Jan. 16, earnings of 70 cents per share beat estimates by 7 cents on a 10.7% rise in revenues. 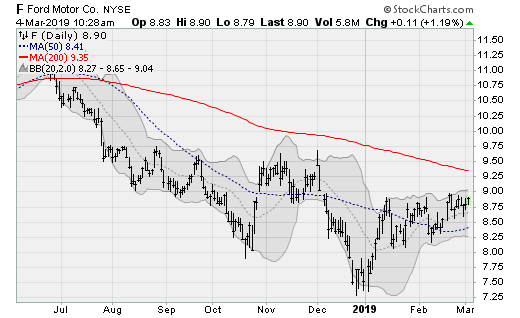 Ford (NYSE:F) shares look ready to break up and out of their three-month consolidation range, setting up a run at their 200-day moving average and beyond. Shares have fallen by nearly one-half from the highs seen in early 2018 as an auto tariff standoff between the United States and its trading partners in China and Europe threatened exports. But hopes of a thaw are emerging, resulting in some buying interest. The company will next report results on April 24 after the close. Analysts are looking for earnings of 25 cents per share on revenues of $37.4 billion. When the company last reported on Jan. 23, earnings of 30 cents per share matched estimates on a 0.5% rise in revenues. 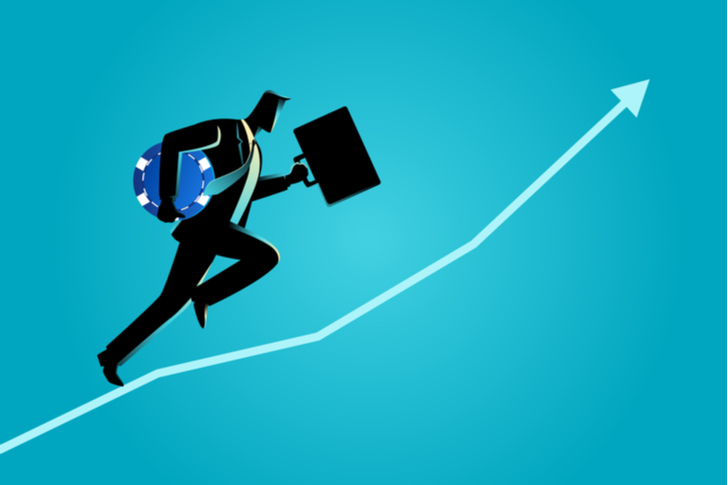 Article printed from InvestorPlace Media, https://investorplace.com/2019/03/blue-chip-stocks-ready-to-rise-bgim/.